HRRN's Jock Talk show, episode #150. Presented by Tito's Handmade Vodka. 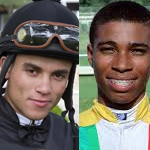 Kristina McManigell spends a half hour with Joel Rosario and a half hour with C.J. McMahon.